The world should declare the US a rogue nation for this act of extreme selfishness. And the Indian government should stop being a pushover. 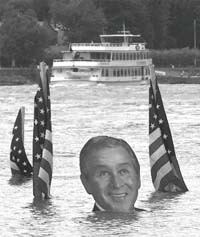 George Bush: "I oppose the Kyoto Protocol"
Even as the us reiterated its rejection of the Kyoto Protocol, the European Union ( eu ) has decided to ratify it. "The eu will stick to the Kyoto Protocol," announced Goran Persson, eu head and Swedish prime minister, at a one-day eu - us summit held at Gteborg, Sweden, on June 14, 2001. The us President George Bush's obdurate stance on climate change has driven negotiations under the critical un Framework Convention on Climate Change (unfccc) to a feverish pitch. The world has now two options -- convolute the climate treaty to meet us demands (including one that countries like China and India take on legally binding commitments), or go without the us, the world's largest and most powerful polluter. The next act of the drama will be played out when the suspended sixth conference of parties (cop-6) to the unfccc continues its work at "cop-6 plus" in Bonn later this month. 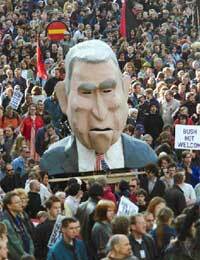 The original cop-6 was suspended in The Hague last November as no agreement could be reached (see DTE, December 31, 2000, Tart Response). The us President George Bush's obdurate stance on climate change has driven negotiations under the critical un Framework Convention on Climate Change (unfccc) to a feverish pitch. The world has now two options -- convolute the climate treaty to meet us demands (including one that countries like China and India take on legally binding commitments), or go without the us, the world's largest and most powerful polluter. History was created on July 23, 2001 at Bonn, Germany, when 180 countries finally reached an agreement on rules to implement the Kyoto Protocol, an international treaty to combat global warming, after almost six months of political uncertainty on the issue. "We felt that we needed that the result (the Bonn agreement) not only for climate reasons, but also in order to show that multilateral negotiations within the framework of United Nations do make sense. 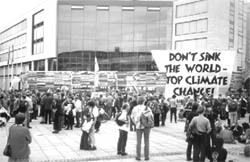 It is possible to reach a result," remarked Jan Pronk, president of the climate change talks held in Bonn, in a befitting reply to the us ' unilateral decision to withdraw from the protocol in March 2001. "I hear no objections, it is so decided," Jan Pronk, president of the meeting, said in obvious relief as he brought down the gavel at the resumed session of the sixth conference of parties to the climate change convention. The meeting, held in Bonn from July 16-27, 2001, outlined details on how to implement the Kyoto Protocol, aimed at reducing greenhouse gas ( ghg ) emissions in industrialised countries.